Patriots' head coach Bill Belichick did not take kindly to Dolphins defender Bobby McCain going down like a limp noodle to slow New England on a punt in Week 5. What's that Bill? Mean Belichick is the best Belichick! When asked about Pitt possibly feigning injury to slow down Central Florida's no-huddle spread offense, coach Josh Heuple quipped, "You guys watched the game, right?" The Knights average an astonishing 48.6 points and 575.8 yards per game. They beat the Panthers 45-14 in Week 5. The behavior is unethical, but there is no rule in college football to penalize team suspected of such tactics--faking cramps, falling to the ground inexplicably. It appears to be happening every weekend against the Knights. Earl Thomas Has a Finger Cramp! Disgruntled, outspoken, and ready to jet away from the overcast shroud of Seattle, Seahawks safety Earl Thomas gave his own team the bird as he was carted off the field with a lower leg fracture. Nothing fake about this injury, or his admiration for the organization. Sigh. 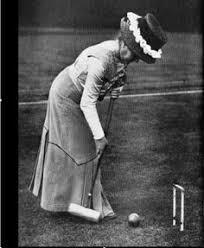 The article "Cheating, Gender Roles, and the Nineteenth-Century Croquet Craze," by Jon Sterngrass (1998) is one of my favorite sports history articles. It touches on social class and gender norms in sports at the turn of the 19th century in America. The best parts are reading about women shuffling the ball with their long dresses to gain advantages and such. Hilarious and enriching at the same time. You can download the article here, or for free from the LA84 Foundation. "Kevin Garnett was probably my favorite teammate as far as communication-wise," Rondo began. "The first thing I noticed about Kevin, the first time we played pickup in 2007, it was crazy how loud he was talking on the floor. I’m excited to get back to that moment where someone behind me is talking defense, talking to me, where I need to be on the floor. Pick coming left, flare right. Having a safety or a linebacker behind you, telling you everywhere to go, it’s gonna make my job and everyone’s job a lot easier." Rondo and James might need to clear the air a bit before tipping off the new season.